I realize that at this point you might be sick and tired of hearing us harp about how great Tamar Adler’s An Everlasting Meal is. But hear me out one more time. Everyone has stale bread. Or at least everyone who has bread at some point and does not eat it all eventually has stale bread lying around. And most of the time it gets thrown away, or responsibly composted. If you are culinarily educated, dear reader, you may already have known of stale bread soup; but as I read Tamar’s book, I was astounded to find out that not only does such a thing exist, but there is a long and ancient tradition of creating soup from leftover bread (Ribollita in Italian). There are a few things that should be said about stale bread soup. First, it is not a soup in the same way that chicken noodle is a soup; stale bread soup is usually much thicker and feels more like a hearty chili. 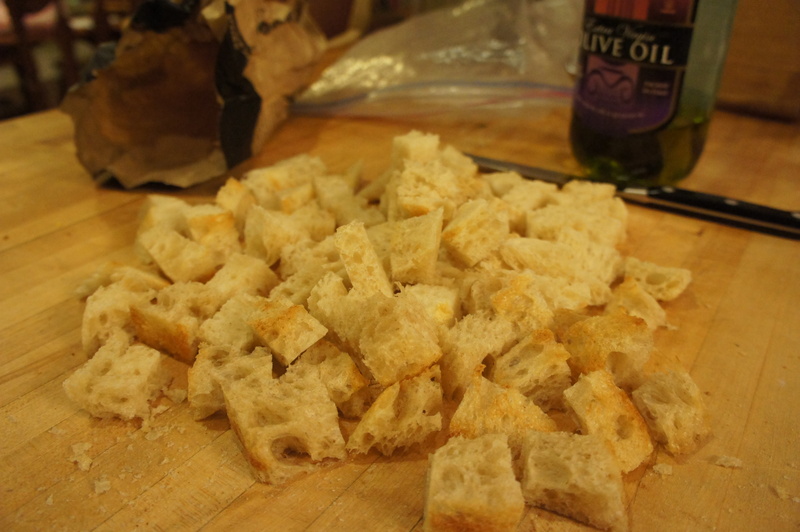 Second, stale bread soup is more of a general idea and a starting point than a recipe. It is meant to be made with whatever is around, provided you have some stale bread (otherwise, you will be making whatever-is-around soup – which could turn out to be vegetables-in-water “soup” if you don’t have any broth lying around). 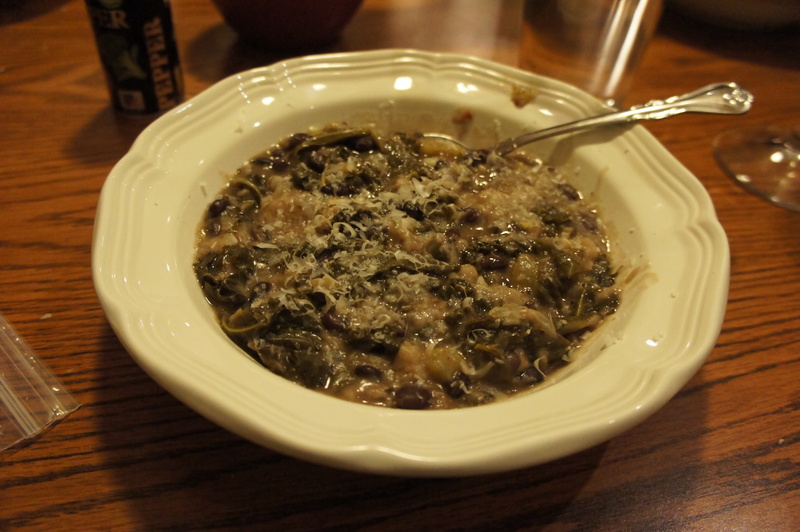 The recipe below is adapted slightly from Tamar’s recipe for Ribollita in An Everlasting Meal. In usual Tamar fashion, you will use A LOT of olive oil in this recipe. We have made stale bread soup twice now, so I’ve noted the different things we used. Heat 1/4 inch olive oil (this is just the beginning) in a big-ish soup pot. Cook the onion and garlic (and celery if you have it) until they soften. Add the herbs and chile flakes and a little bit of salt. Add the tomatoes and cook for a few minutes over medium heat. Chop the greens (and remove from the stems) then add to the pot, and add the water. Cover and cook over low heat until the greens are wilted. Put in all your broths/waters/juices and the beans, plus the Parmesan rind. Bring to a simmer, then add the bread and more olive oil (Tamar says to add 1/2 cup, but I was not brave enough and probably added about a 1/4 cup at this point). Cover and cook for 1/2 hour on low, stirring occasionally to make sure the bottom doesn’t burn. The bread will soak up the soup and then liquify into it. Taste it, add more broth or salt or whatever you want, and then take it off the heat. Add in another 1/2 cup olive oil (Tamar, are you crazy!?!? I probably added 3 tablespoons here) and take out the Parmesan rind. You can grate Parmesan on top and add some pepper to serve. This soup is perfect for a windy, rainy, cold, or dark winter/fall night. The other night, dinner rolled around, and I was feeling incredibly lazy. Nothing that I could think of eating actually sounded good to me, so I put Jonah in charge. There’s a restaurant here in Portland called Por Que Non that has really good Mexican food. They have this dish called a Bryan’s Bowl that is just a bowl of delicious rice and beans and meat and cheese and guacamole and salsa and everything you could ever want in a little bowl. It’s incredibly good. So Jonah suggested making something like the Bryan’s Bowl, and I was not particularly optimistic, because usually when restaurants have something like that they have some secret delicious sauce they pour over it to make it so freaking good. And we didn’t. But…oh well. So he searched something or other on the internet and found this recipe for Cilantro Lime Rice to use as the base for our Mexican bowls. And man oh man, it made all the difference. Let’s start with the rice. Put the rice, butter, garlic, 2 tsp of lime juice, broth, and water in a pan. Bring the contents to a boil, reduce the heat to low, and cover and cook the rice until it’s tender (about 15-20 minutes). While the rice is cooking, mix the leftover Tbl of lime juice with the sugar and cilantro. When the rice is done, remove it from the heat and stir in the cilantro/lime mixture. While the rice is cooking you can also prep the rest of your ingredients for your bowl. We drained the beans and just heated them in the microwave, chopped the onions, and got out the salsa, guacamole, sour cream, cholula, and some tortilla chips. Now it’s time to assemble your bowl. I did mine kind of like you would if it were the filling of a burrito, making even layers of all the ingredients I wanted. I also used my bowl as kind of a layered dip and ate it with tortilla chips for an added bit of crunch. Oh man. I may not have been in the mood for this meal at the beginning of the evening, but it really hit the spot! Enjoy!